Lombok RING Sterling Silver and feature South Sea pearl. Choose Blue or Natural. Pearl Dia. 0.5” Available in sizes 6-10 YRR17 $175 Now $135 Bruges Blouse 100% Belgian linen with check neckline, band collar and mother of pearl button front. Choose from Salmon, Blue, or Lavender. Available in S, M, L, XL, and XXL WC91 $115 LOMBOK STUDS Genuine blue or natural Mabe South Seas salt water pearls set in Sterling Silver. Choose Blue or Natural. SINGULARITY JEWELRY Sterling Silver with rose gold finish and garnet center stone. B. SILKLOOK CORD Synthetic silk with Sterling Silver clasp. Available in Black, Silver/Gold, Gold, or Silver L 18” YYN12 $9 Group A. See facing page for Lava Split Top and Lava Sleeveless. sahara casuals These cool, smooth, lightweight pants are soft and supple. The elastic and drawstring waist makes for a great fit and fresh profile. If you want to look comfortable(yet put together) visiting a museum or going to the theatre, the Sahara Casuals are your choice with practical, straight legs and subtle pockets all around. 100% cotton. How to Order Call our toll-free number 800.641.0137 or see www.easternserenity.com for online ordering. To mail an order, please download an order form from our website or call us and we will send one out. We accept major credit cards or personal checks or money orders (with mailed orders). After you order, an email will be automatically sent with order details and a record of charges. We don’t have a fax number. Shipping We ship by FedEx or the USPS depending on the size and destination of the package. In-stock items generally ship within 48 hours after the order is received. Some out of stock items may take up to two weeks. When the order is shipped, an email will be automatically sent with details and a tracking number. Shipping and Handling Rates Item charges of $75.00 and under (and all jewelry only orders) - $9.00 Over $75.01 (no extra charge for jewelry) - 12% of item total Shipping rates to Alaska and Hawaii understandably vary from the above basic schedule. Please call for confirmed shipping charges. Backorders Some items prove to be more popular than predicted. Unfortunately, due to the handmade nature of our products, most of our items are carefully made by specialist artisans that cannot be rushed, but we are also aware that some orders are primarily for gift giving and recognize the disappointment when friends and family can’t receive a gift in time for the special day. A customer service representative at 800.641.0137 will work through the details with you on these occasions. Rush Charges We offer rush delivery in two to four days for an additional $15.95. Expedited shipping is for in-stock items only and cannot be shipped to P.O. boxes. These rates apply to items under five pounds only. Catalog Prices and Sales Tax We strive to keep our prices steady over time; but shifts in currency exchange rates and the cost of raw material may compel us to change these prices at any time without notice. All prices, descriptions and typographical errors in this catalog are subject to correction. We are only human after all. We charge applicable tax for orders within the state of New Mexico. Guarantee Eastern Serenity stands behind the quality of everything we sell. We offer a 100% guarantee (that includes shipping cost for replacement) for damaged, defective, or incorrectly shipped items. If the items were damaged in shipping, you must hold the original packing materials and damaged merchandise for inspection by the shipper, otherwise no claim, replacement, or refund can be honored as per FedEx policy. Please notify customer service at 800.641.0137 within 48 hours of receipt that you have received damaged goods. We will then give you the return shipping information and work through the return details. Returns Any return for reasons other than damaged, defective, or incorrectly shipped items can be sent back for a refund for up to 30 days after you receive it. All returns must be shipped to our PO Box by way of the USPS with a tracking number. Returns received over 30 days after initial receipt by the customer will be accepted for catalog credit only. You can exchange your order for other merchandise for up to 60 days after receipt and after that any purchase is no longer eligible for refund or exchange. Mailing Lists and Privacy We occasionally make portions of our customer information available to selected organizations; if you wish to opt out of these exchanges or unsubscribe from our catalog or newsletter mailings please call us. If you no longer wish to receive our catalogs, call us and unsubscribe, and the best way to remove your name from all unsolicited mailings is to contact the Direct Marketing Association at the following web link: www.dmachoice.org. We never share email addresses or telephone numbers. Sizes and Fabric Care The chart below details the measurements of our standard sizes. The women’s sizes reflect body measurements. These are normal American sizes, similar to the majority of recognized retailers. We assure you that, although we carry Asian styles, we are not using Asian sizes. Our pictured models are about 5’7” for reference purposes. Scan here to shop our mobile website. 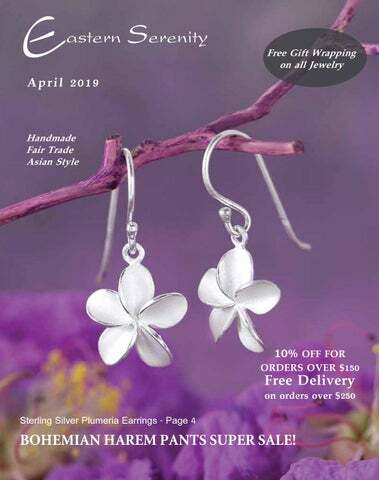 SALE - For any order placed before May 15, 2019 where the items chosen total over $150 (after any discounts are applied); an ADDITIONAL 10% discount will be applied when coupon code SPRINGFORWARD is entered at checkout or mentioned during phone ordering. - All orders over $250 (after all applicable discounts are applied) will be delivered automatically free of charge until May 15, 2019; no coupon code is necessary. - Items in our collection that are not in this catalog may not be eligible for either of these promotional offers. - Purchases made under the Half Price offers (see our web site) are not eligible for exchange or return, all sales are final. A BRIEF WORD ON SHIPPING We ship by FedEx and the US Postal Service. Packages under about 5 pounds will be shipped postal service and over 5 pounds will be shipped by FedEx. If your order is more than $100 we do require a signature when delivered. If you anticipate not being available to sign for a delivery, perhaps a secondary address can be chosen instead to prevent any unnecessary delays. HANDMADE UNIQUE Our apparel selections are absolutely handmade in very small production lots, often using unique materials unsuited for industrial processes. Every item has a level of consideration that is just not possible in a large scale setting. We use a network of experienced family businesses to produce some wonderful things that you will literally see nowhere else. The jewelry is all handmade, either directly by hand using pure silver or cast Sterling Silver; created, set, and finished by hand. The world is big enough for both mass-produced items available through enormous firms and also for original designs made with skill and care by small groups living outside the corporate control. Sometimes the small decisions we make each day determine our shared future more than we realize. EASTERN SERENITY is an independent project that strives to bring beautiful things to interested fellow travelers. Our collection is produced by individual folk artists, village groups, and micro-businesses owned by single families. We donâ&#x20AC;&#x2122;t purchase from wholesalers, dealers, or middlemen. We mailed our first catalog in 2007. Our products are only available through our catalog and website, we do not offer our collection on Amazon, eBay, or any other third party platform. We strive to offer fantastic, unique products, fair prices for customers, just compensation for suppliers and staff, and to support constant product improvement. We hope our principles ultimately promote increased freedom and self-reliance for all of our collaborators. Our team and suppliers are close knit, and many have been with us since the beginning. Growing and developing together has been a wonderful experience - especially in contrast to the extreme centralization and monolithic developments of the last ten years. We are, above all, motivated by a drive for justice in commerce. When given the choice between a corporate giant or a small competitor, we always choose the smaller company. From using a local ISP for our internet in Santa Fe, a small but excellent printer in Maine to print our catalogs, and buying our computers and supplies from specialized independent dealers, our commercial actions are informed by where the money ultimately ends up. By collaborating with small producers (generally working by hand) and presenting their creations directly to the public, we believe that many of the negative effects of modern trade can be minimized. The vexing and ridiculous intricacies of small business demands active cooperation with staff, suppliers, and ultimately, customers - to address challenges with different techniques than those used by larger companies operating from a position of overwhelming advantage. Our catalog production and product sourcing team is based in Chiang Mai, Thailand. Products are actually shipped to our customers from Santa Fe, NM. Eastern Serenity controls every step in the quality and shipping processes ourselves. We inspect and pack everything in Thailand, then unpack and re-inspect everything in Santa Fe when it arrives. Then, once again, before individual items are shipped out to our customers, everything is checked one last time to ensure perfection. We source no products from China. Plus, we love love love the US Postal Service, the greatest expression of democracy ever conceived. We only trade with people we know; and when you order from us, we will get to know you also. We donâ&#x20AC;&#x2122;t cut corners. We are careful. Rough LEATHER CORDS (C),(D) Sturdy rectangular cut leather with a softened rawhide feel. Sterling Silver hook and loop fastener. Choose Black or Brown YFC11 Available in 18” $9 or 24” $12 lengths. KATA Drawstring Pants Light blended rayon and cotton pre-shrunk super casual pants. Open cuff and straight leg let in the breeze and lays smoothly when bunched.